The good news is that self-compassion is a skill that can be learned by anyone, bringing a greater sense of ease, happiness and better health. Anna teaches mindful self-compassion (MSC) as an 8-week programme in Auckland, New Zealand, as well as offering intensives, short workshops and day seminars by design. intensives for groups of between two and six people in an authentic Mongolian yurt, nestled in the bush at Waihi Beach. Ideal for couples, mothers-and-daughters, or small groups of friends who wish to learn these important practises from two expert teachers, in an exclusive and unique setting. Compassion in Healthcare Conference, March 16-17, 2019. Kindness Matters: An introduction to the science and practise of self-compassion. Kindness Matters: Self-compassion in clinical practise. Join Dr Anna Friis and Megan Troup for a weekend workshop dipping your toes into the powerful practices of mindfulness and self-compassion. 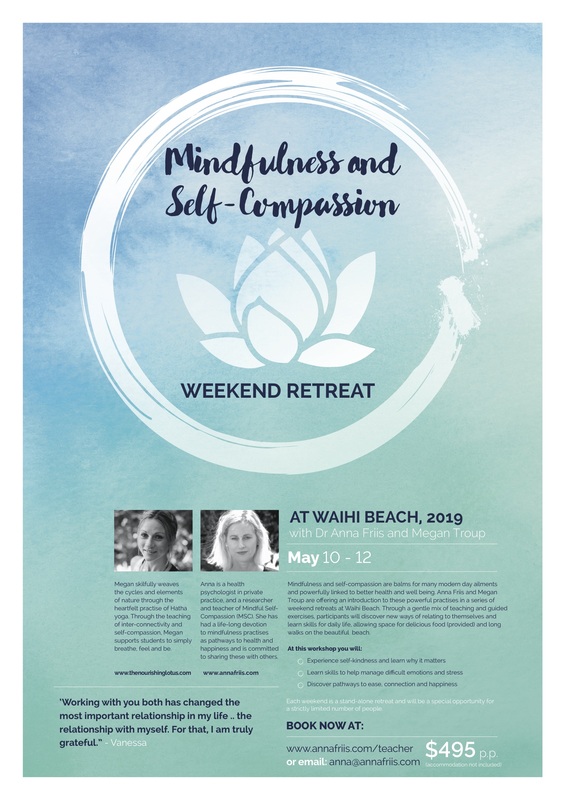 Each weekend includes an introduction to the science and practise of self-compassion, restorative yoga,, and time to simply "be" in the beautiful surrounds of Waihi Beach.